I’ve got thousands of Euros worth of camera lenses. All of them Nikon, and all of them great in one way or another. But in terms of which lens gives me the best bang for the buck, it’s got to be the standard 50mm F/1.8D lens….. it’s sharpness, contrast, and colour rendition is equal to many of my lenses costing ten times the price. It’s great as a low light lens also, with a maximum aperture of F1.8, meaning it can still keep going in low light situations where other lenses have given up a long time ago. But probably the best thing about this lens is it’s price: only 100â‚¬ to you, sir…. A 50mm lens has pretty much always been in Nikon’s lens line up, and in the times of 35mm film, and before zoom lenses had become as popular as they are today, was considered a ‘standard’ lens to have – the reason for this was, at 50mm, it gave the closest field of view to that of the human eye, which for most people is around 55mm. This meant that in terms of perspective, what you saw through the viewfinder of a 35mm SLR fitted with a 50mm prime was pretty much as you saw it when the camera was taken away. In the 90’s, as the quality of zoom lenses became better, and their respective prices lower, the 50mm lost it’s popularity, as people preferred to go for something a little more flexible, but now we are into the digital age, with a crop factor of 1.5x, the Nikon 50mm becomes a useful 75mm in 35mm terms. So right in the middle of the range considered good portrait lenses in terms of perspective. The first picture in this blog entry, taken of Sigal using studio lighting, is an example of this. It enabled me to get a good working distance to the model, and by using selective focussing and a wide aperture (in this case f2.2), I was able to throw most of the image out of focus, keeping the eyes sharp, and making sure that is what the viewer’s attention is naturally drawn to. If I recall correctly, with this image I had absolutely no need to apply any sharpening in post processing. Due to the size of the lens, it always goes into my bag when I go out taking portraits, and invariably gets as much use as its bigger brother the 85mm f1.4D. Another situation where I have found having the nifty 50 in my kit bag invaluable is when shooting gigs. 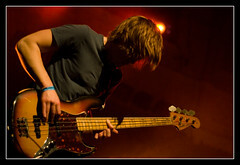 In fact, so much so that now I typicaly go to gigs with just the 50mm attached, leaving all the other lenses at home. This has the advantage of a camera setup that is relatively compact, and no need to worry about all the other gear getting knocked or covered in beer. And again the field of view of the 50 is just right to get frame filling portraits, providing you have managed to get a good position near the front of the stage, as can be seen here in the shot of Air Traffic when they played at Paradiso in Amsterdam earlier this year. But of course the most important characteristic of shooting in low light situations such as concert halls, is this lens opens right up, giving enough light for the AF to work, and a wide enough aperture to keep the shutter speed high enough to get sharp results. So again, this is a great little lens that is small enough to take anywhere, sharp enough to cut your finger, and cheap enough to fit into anyone’s budget. The only downside of the lens is that it hasn’t yet been upgraded to a AF-S lens, but in the sort of photography I use this lens for, fast focussing speed isn’t that important. 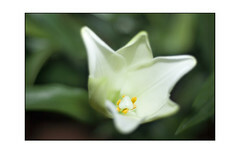 You can see more examples of shots taken with this lens in my flickr photostream. Where did you get the lense for 100â‚¬? Well, when I bought it 2 years ago, the price was 98â‚¬….. seems now though that Nikon has raised the price, and now the cheapest I can find it in the Netherlands is around â‚¬129. Guess it goes to show the increased popularity of the lens. Still a bargain though….